Scottie Love is in the air. Can you feel it? 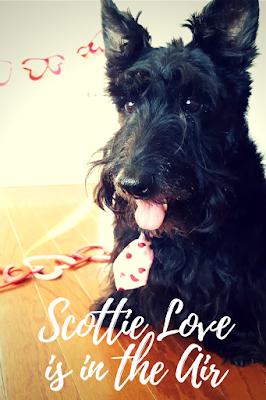 With days left until Valentine's Day, I'm opening the Scottie Love line, encouraging everyone to submit “gotcha” stories of how your pup came into your heart and your home. Tell me all about your puppy love story below in the comments. Share as little or as much as you want about your "gotcha" story! A lucky few will be profiled right here on the blog. Scottie Love found me by accident. I accompanied a friend to a shelter because she wanted to welcome a dog into her home and can you guess which one of us ended up finding a furry friend to love that day? Hint: not her! I found Mr. K depressed and all alone at the shelter. He wouldn't even make eye contact with me and he looked nothing like a Scottish Terrier. Still, I knew I had to give this sweet boy a forever home. No one deserved to be that unhappy. The rest, my friends, is history. See Mr. K's dramatic transformation. Fast forward about a year later and into my life came Heather. I was determined to find Mr. K a friend, having moved to a new city and taken a new job that kept me away longer than I would have liked. That's when I spotted a gorgeous wheaten girl in the care of Tennessee Scottish Terrier Rescue. She had been found in a raccoon trap, was missing some teeth and yet, she was perfect in every way. Mr. K and Heather pretty much ignored each other when they met but it didn't take long for them to be bitten by the Scottie Love bug. The two were inseparable until Heather's passing. From raccoon trap to forever home: Heather's story. When I decided it was time to expand the Scottie Mom family, the crew literally doubled in size overnight when a bonded pair came home. Once again, the Scotties ignored each other at first, but it was clear Nibbles had decided she and her brother Pudley were exactly where they needed to be when she hopped into the Scottie Mobile without invitation and sat there patiently waiting to be chauffeured to their new forever home, where happily ever after they shall live. 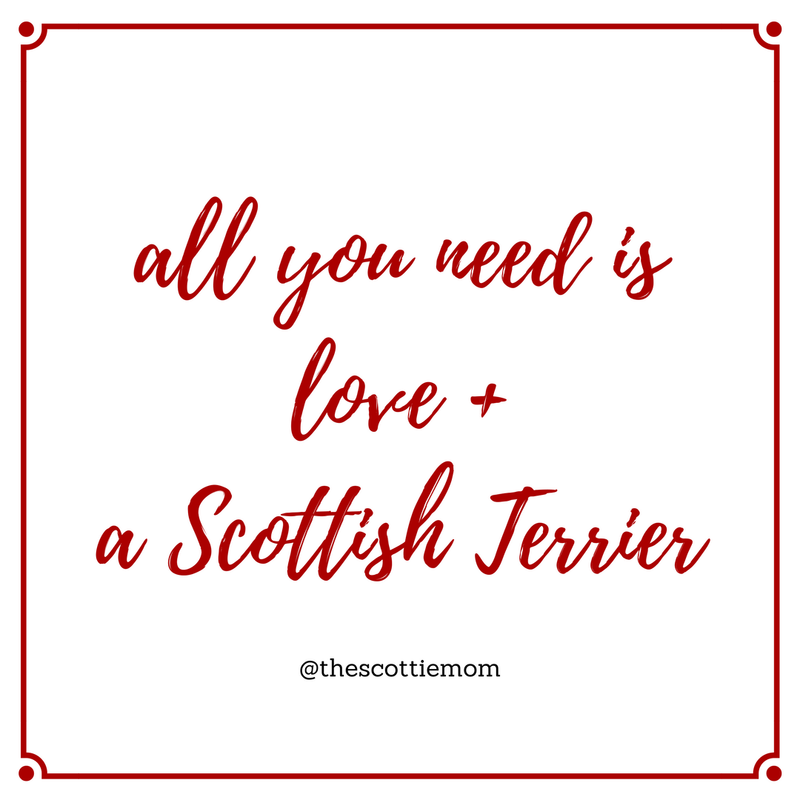 Now that you know my Scottie Love story, it is your turn to share yours! Was it Scottie Love at first sight? Or maybe you were bitten by the Scottie Love bug a little later on. Whatever the situation, I'm sure it is a Scottie Love story to remember and I'd love to hear it. Share the details below or contact us here to submit your Scottie Love story for consideration as a feature on the blog. I would like to share about our Barney :) He is a 3 year old rescue! We have had him 4 months,he never knew what a yard or a house was.He now knows what love is!! He came in to our lives for a reason,our Andy went over the Rainbow Bridge last June from nasal cancer. Kathy - Feel free to email pictures to thescottiemom(at)gmail(dot)com. Thanks! I met my boy Bentley at the Bucks County SPCA here in Pennsylvania. It was April 2010 and I kept going there weekend after weekend to find the right pup for me and my hubby. When I put my application in on a Monday, they told me he had to go thru evaluation andtold me to come back on Saturday...then on Saturday they called and said the people who brought him wanted to reclaim him... to make a long story short, he original family changed their minds again...and I was determined to come home with a dog! We brought Bentley (then called Scruffy.....yucky name) home and he bonded immediately with me. About 3 weeks later I ended up in the hospital with a very grave staff infection in my spine....almost died and was quadriplegic for a while. I was in the hospital for 2 months and looked forward to seeing Bentley's little face again EVERY day! In the meantime, my husband (who did not want a dog) bonded so tight with Bentley it was amazing. He even brought him to the hospital with the help of my physical therapists to visit. I think to this day that God planned and made Bentley come to us. He was my therapy to get well and still is to this day the love of our lives. I did not intentionally go after a Scottish terrier, but now, after having one, I love the breed and would LOVE to get a pal for Bentley. He is the best thing that could have happened and exactly WHEN it happened was key. What a lovely idea. Neither of us are rescues but we look forward to reading more stories about rescues. My story is I was rescued after being sold in a pub by a puppy farm owner. My new owner wasn't very nice so I was rescued after one day in their care and then given to my people by the rescuers at 17 weeks. I was not socialised and was a bit of a terror for quite a while. Have a wonderful Wednesday. 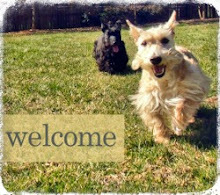 Wally and Sammy - you don't have to be a rescue to have a Scottie Love story! 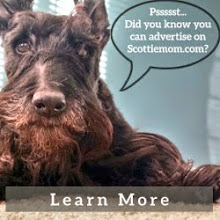 Tell us how you made your Scottie Mom fall in love with you!! We adopted Kasper at 9 months old as his old owners split up. He arrived with a myriad of issues, being very fearful of men and very hand shy. We have had him 3 years next month, can't believe it!! Well, you ask for it. I found My peeps online looking on thanksgiving for another Scottie cause Mom wanted her own. the next day they called and made the rush trip 60 miles to get ME, I was a mess, was born in a puppy mill, lived in a cage outside for 8 months,purchased then dumped at a pound cause I was not sociable. The rescue place found Me the Day I was to be put down. Anywho, Mom saw me and said, "You may be a mess, but love will fix you up", then it's off to my forever home, now one Diva Scottie! My full story is under our header picture! Gosh, what a cute doggy ^_^ Whee might even like meeting that doggy because it's not all big and scary like some! We got Brodie from Judy&Phil DiGirolamo in CA 5 years ago. He is the coolest, most friendly Scottie we have ever had. Of course, he was lonely, so we got Bailey, our little diva but brave hunter, from Margo Park in Bradenton, Florida. They do everything together, and are SOOO happy to have them. They do Scottie "nose kisses" every am and pm, go everywhere in the car with us Scotties rule and other dogs drool! They are definitely in our hearts-could not live without them. A thrill-a-minute, but so soft with us too. I found my precious little Scottie in a local, family run pet store who from time to time would sell dogs from local breeders. I had done a lot of research prior to visiting the store and figured out which type of dog would best fit my life and personality. I was determined to get a Westie until Lily, my Scottie, looked at me and put doubt in my heart about the Westie. The little lady that ran the store told me that Scotties and Westies were very similar. She told me I couldn't go wrong with a Scottie. I think she was secretly laughing on the inside because she could tell I had no knowledge of the breed. Lily has challenged me so many times in our life together, but I love her for it. She is so determined, so hard headed and stubborn but I wouldn't change her for anything. I thought I would be bringing home a sweet, innocent little puppy, but boy was I wrong. Scotties are a very special breed and I believe that only special people are blessed with them. I met my precious Lily nearly 8 years ago and she has been rocking my world ever since. Well Sweet William The Scot does not have much of a story. But the one before me Half Pence he has a real story to tell. Maybe my Lee will tell it on her blog. Even after he died Lee believes he has reached out. Why on his birthday Lee woke up to a itch on her are and when she looked the mark on her arm was the shape of a perfect heart where he always rested his head. Lee even went to the dermatologist that day to have it checked out because it appeared over night. The dermatologist is a friend and has known Lee for years was amazed at its shape and she knew it had not been there a month earlier. Half Pence had a lot of mysteries. My mom grew up with Scotties, our whole family is devoted to the breed. We were on a wait list for years until our sweet Tassel came along! I was 11 years old when we got the news that our breeder was expecting a litter of little Scottie nuggets. We brainstormed so many names! For years my mom wanted to name our Scottie Aberdean, but then when the time came she decided it was too "common" (I mean really, she named me Glynis). One day at my grandparents' house, considering Scottie names, I was looking at the oriental rug and noticing how my grandmother always makes sure that the tassels are straight. Any doggie in our family would be sure to ruin those perfect tassels, so I suggested it as a name and everyone loved it. A few weeks after all the puppies were born, we went to the breeders house to figure out which puppy was Tassel. My mom and dad let me pick, since this would be my very first dog. All the puppies were asleep except for one... She was climbing all over all her brothers and sisters while they slept, and I knew that was Tassel! I couldn't wait until she was old enough for us to take her home. On the cold winter day when we finally could pick her up, I brought one of my favorite polar fleece blankets for her to snuggle in the car. She was so little! And she's still the Alpha girl of the whole family, with everyone wrapped around her paw. That first night, my parents tried to kennel her... She squeaked all night so my mom let her into their bed, and Tassel has slept there every night since! Most times on her back under the covers, stealing half of my dad's pillow. Tassel turned 11 on this past Pearl Harbor day, and she's just as playful and feisty as on the day we brought her home. Her favorite pastime is stealing toys from her soft coated Wheaten brother Buck, who we rescued a few years later. It would be lovely if you find some Scotties homes where they'll be loved. When the peep was wee and groin', the neighbors always had a female Scot. Jigger passed when he was young, Cricket when he was in high school and Mini when he left home. After college, the army and getting estabished, it was time. 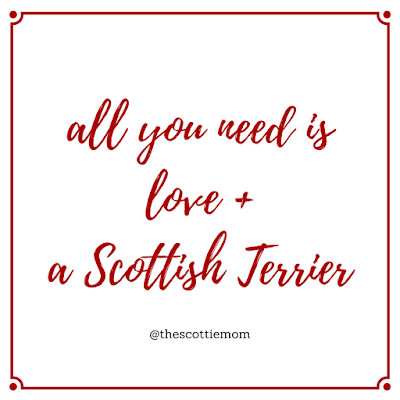 He wanted a terrier (terriers belong with terrier peeps and vice versa) and there was a Scottie girl who desperately need a home. It worked like crazy until Dec 2014 when melanoma took her. We all still miss Ms Kyla. My Scottie isn't a rescue but he's pretty lucky. We already had a 5 month old westie puppy when we found an add for Scottie puppies. As the days went by and we debated on getting one the price kept dropping. Finally, we made the two hour drive to pick out our new addition. We arrived early and the breeder told us she didn't get time to wash the puppies. They all had this clear drainage around their eyes. We picked out one and headed home. My husband quickly named him Carbon. One the drive home he had multiple emesis then had loose stool all over our carpet that night. A few days after bringing Carbon home my husband had to go out of town for work. I was a new nurse on night shift and Carbon cried and barked all day. I got no sleep. It was November and Carbon was too cold outside. I would come home and find him soiled in feces in his cage. I begged my husband to return him but he refused. He ended up having a severe eye infection that my westie caught. Carbon bit and chewed up everything. Carbon slowly became a good dog. He learned to listen and became a loving dog. Shortly before his first birthday he developed a tumor on his left ear. After many vet visits it was determined to be a binging histyocytoma that would subside on its own. Late one night he woke us up violently crying. We found him under our bed in a pool of blood. The tumor ruptured. We rushed him to the emergency vets. They performed emergency surgery to remove the bleeding tumor and about 1/3 of his ear. He tolerated the surgery well but Spent the next three week in a cone and a head dressing. We anxiously waited the cytology results fearing the worst: mast cell carcinoma. After an awful fungal infection and a whole bottle of Benadryl the cone finally came off and all cytology came back benign! He is now my best friend and the best dog I've ever had! He is my side kick and my protector! I couldn't imagine my life without him and I thank god everyday for him! After having Dalmatians for 20 years, we were down to Buddy, our rescue Dal from CA. We felt that Buddy needed a companion. I found Kathy Roche out of Missouri, who was rescuing Scotties from puppy mills in her area She had Dougal's picture posted. He was only 4 months old. I fell in love the minute I saw him. She drove him up to MN and he settled right in to our family. It was Spot & Scot. ❤🐾🐾❤. They were inseparable until Buddy passed. Dougal was devistated without Buddy. We immediately contacted Kathy again for another Scottie. Poor Ace (horrible name) was 2 years old when he was thankfully rescued. He had spent his first 2 years living in a small cage out in a ramshackled shed. We drove down to Missouri in an ice storm to bring our boy home. We renamed him Angus and he now knows only love and comfy beds all over the house. The boys have a 1/2 acre fenced yard to run and play in. They are inseparable. We were a little worried about Angus because of his lack of socialization, but we now call him the Nanny Dog, because of how fond he is of our grandchildren. He watches over the babies like a hawk. They are the loves of my life! I was looking for a dog, was interested in a Scottie or Westie, preferred a Scottie. All the ones close to me were more than I could afford. I didn't know about Scottie rescues at the time, but there weren't any in the shelters near me, either. Finally I heard about a small breeder in South Dakota. Long story short, I fell in love with Victoria Rose via the pictures the breeder posted on the website. I drove over with my parents over the course of 2 days to pick her up. I was jealous as my mom got to hold her first while I filled out the paperwork to make her my own! We had a rough start as she had picked up the parvovirus unbeknownst to anyone and had to spend her first week at the energency vet hospital. But it's been almost 4 years now and I wouldn't trade her loving companionship for anything!